Do you have crabgrass where you always do? Do you have crabgrass where you have never seen it before? You are not alone this year. You can chalk this up to our weather patterns this season, as you likely have foliage fungal disease and mushrooms in the lawn too. Crabgrass is a warm season annual grassy weed that waits for the soil to warm up before the seeds germinate and seedlings emerge. 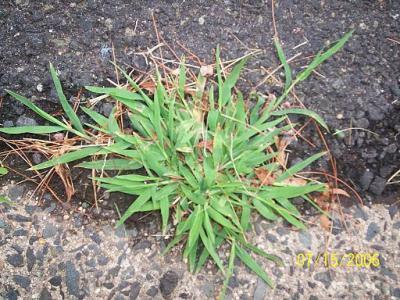 It is common to see crabgrass in parkways and the lawn where our preferred grasses are not very thick. Crabgrass also needs moist soil to begin its growth each year from seed, something we have had in abundance. Crabgrass is often called "water grass" as its hairy leaves will trap water droplets on the leaves and can be seen like that after a rain. That little fact can aid in the positive identification. There are two versions, smooth crabgrass – a smaller plant with limited hairs on the leaf – and large crabgrass, which has more hairs and is bigger. Both do the same damage of smothering surrounding grass for the rest of the summer, giving them a strong opportunity to come back in the same spot in 2018. Compared to our lawn grasses, crabgrass grows in a prostrate manner. Crabgrass preventers usually are put down early enough in the spring to prevent the crabgrass seed from germinating or to control the very tiny seedlings. These products provide a limited time of protection. We count on the weather patterns to create an environment unsuitable to crabgrass seed to germinate, mainly by drying out the soil. This season the water has just kept coming along with the warm temperatures while the protective period has run out so crabgrass seed has continued germinating. As seedlings and younger plants their color is a decidedly lighter green than our lawn grasses and the leaf blades are quite wide in comparison. If left to grow that prostrate habit allows the flower stalk and flowers to escape being mowed off and the seeds just need to fall to the soil to be in place for next year. If you see a few plants, picking them out before those prostrate stems root down is an easy way to deal with crabgrass now. As a seedling, the fibrous root system has not yet established. Pulling them is much more difficult later. Gardeners should keep track of the worst spots and plan on a crabgrass preventer for 2018. You also can promote the cool season grasses to grow back into the thin areas yet this fall to lessen the chance for crabgrass next year. A bit of topdressing and over-seeding can really help. If the weather pattern looks bad again in 2018, some products allow a second application of preventer to extend the protective period. Most of the commercially applied products have a longer period of protection. Crabgrass seedlings and plants can be added to the compost pile as long as there are no seed heads present – at least you get something back for all your efforts on your hands and knees – compost.